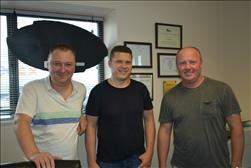 Meet the Staff of Car City, Inc.
We are Dmitriy, Kaspars, Vit - your team at Car City Inc. in Palatine! After many years working at separate places, we decided to team up as partners in Car City Inc. in February of 2010. It is our wish that we can provide you, your family and friends with the best possible experience when buying your car, truck or SUV! We work hard to find the best possible cars and to provide the best possible service. Our motto is "Best Deals on Used Cars" and we will work with you to make that true for you! Over the years, our customers have told us that they value our no-pressure approach to the car buying process and we appreciate the many referrals to friends and family that we have received. From the moment you step on our lot until the time you drive away in your next car, your buying experience with Car City, Inc. is our number one priority. We encourage you to use the expertise and resources of our sales staff; they are here to help you find the right car at the right price. Call us today at 847-496-4250 to schedule your test drive!